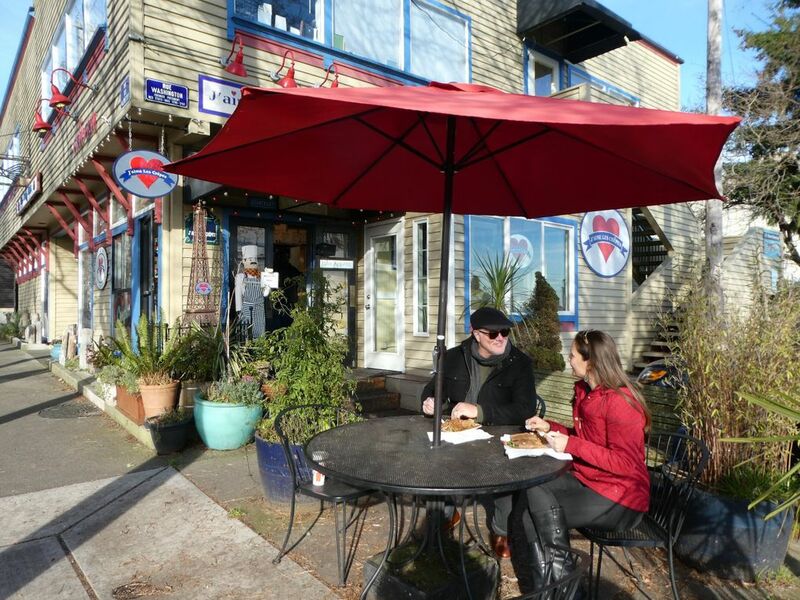 With farm-to-table meals, mini doughnuts, inviting beachside trails and much more just a ferry ride from downtown Seattle, Kingston is the perfect place for a winter day trip. This is the first in an occasional series, Day Trippers, focusing on accessible, low-cost out-and-back trips throughout the region. 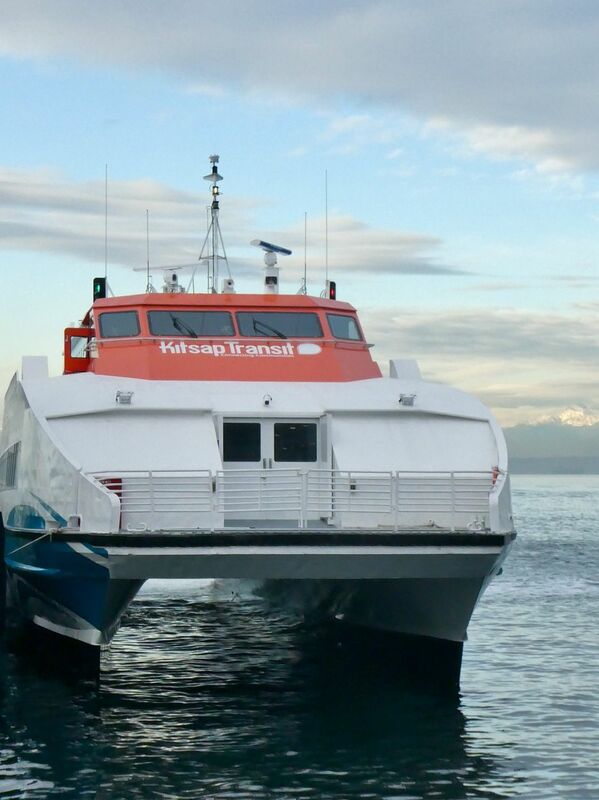 More than 100 commuters walked off the new fast ferry linking the quiet hamlet of Kingston on the North Kitsap Peninsula with downtown Seattle. Only five of us were in line to go the opposite direction. While more Kitsap County commuters have been using the new passenger-only ferry each week since Kitsap Transit launched the service in November, few take advantage of the “reverse commute” — sailing from Seattle to Kingston in the morning and back to Seattle in the late afternoon or evening. “There have been plenty of times when one person has pretty much had the boat to themselves,” says Seth Harris, a marine service ambassador for Kitsap Transit who handed us our boarding passes on a brisk January morning. My husband and I and the three others all had the same idea. Why not take advantage of the 40-minute crossing over the Puget Sound to spend a day in Kingston, a picturesque waterfront town previously reached mainly by driving 17 miles from Seattle to Edmonds, and taking a 30-minute ride aboard a Washington State Ferry. For Elizabeth Sully and Tim McGoldrick, the new ferry meant they could plan a day visiting friends in Kingston without the hassle of driving to Edmonds and parking their car. Like us, they took a bus downtown from their house in Greenwood in time to catch the 9:35 a.m. ferry at Pier 52, arriving in Kingston at 10:15 a.m. Chances are more Seattleites will discover Kingston once Saturday fast ferry service begins in May. (The ferry currently runs Monday-Friday.) Until then, Kingston makes a budget-friendly midweek winter getaway. Here’s an itinerary to try. Show up at Pier 52 on the Seattle Waterfront, and board the Finest, a ferry that operated between Manhattan and New Jersey, and was named after the New York City Police Department. 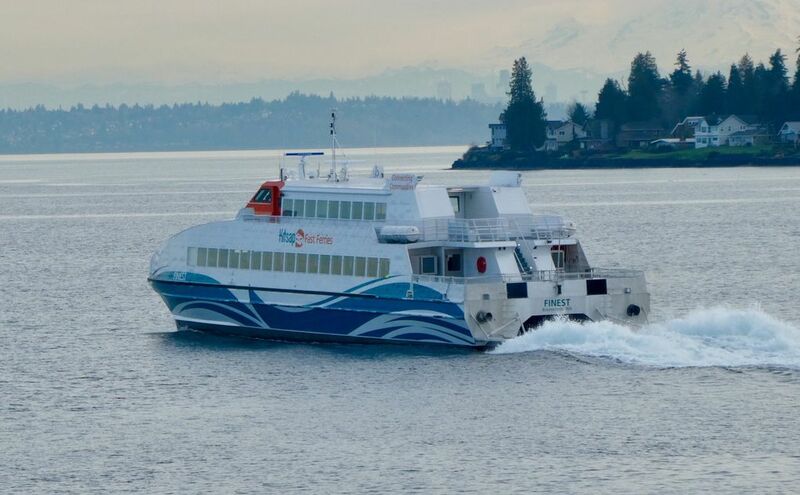 Kitsap Transit bought and refurbished the boat with revenue from a sales-tax increase passed to fund a fleet of new passenger ferries, including the walk-on Bremerton/Seattle service launched in 2017. Buy tickets from machines, use your ORCA card or bring exact change. (One-way fares are $2 eastbound, $10 westbound and $1 and $5 for seniors and youth.) Settle in for a scenic ride with views of Mount Rainier and Mount Baker. Exit the ferry though the walkway next to the Washington State Ferry terminal, and find Aviator Coffee (aviatorcoffeesandteas.com) in a wooden shed called the Hangar. Burlap coffee bags cover the ceiling, and mini-donuts sizzle in a pan near a walk-up window. The Bainbridge Island roaster offers free doughnut samples, and a 15 percent discount on the “drink of the month,” (an English toffee latte the morning we stopped by). Most of Kingston’s independently owned restaurants, bars, cafes, bakeries and shops are along Highway 104, all within walking distance of the ferry. 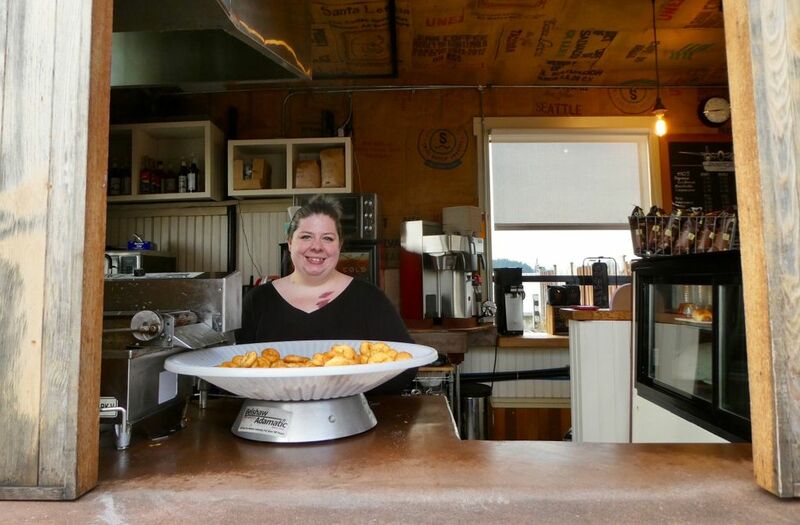 Open early on weekdays is Lacey and Kory Anders’ Borrowed Kitchen Bakery and Farmhouse Cafe (borrowedkitchenbakery.com). 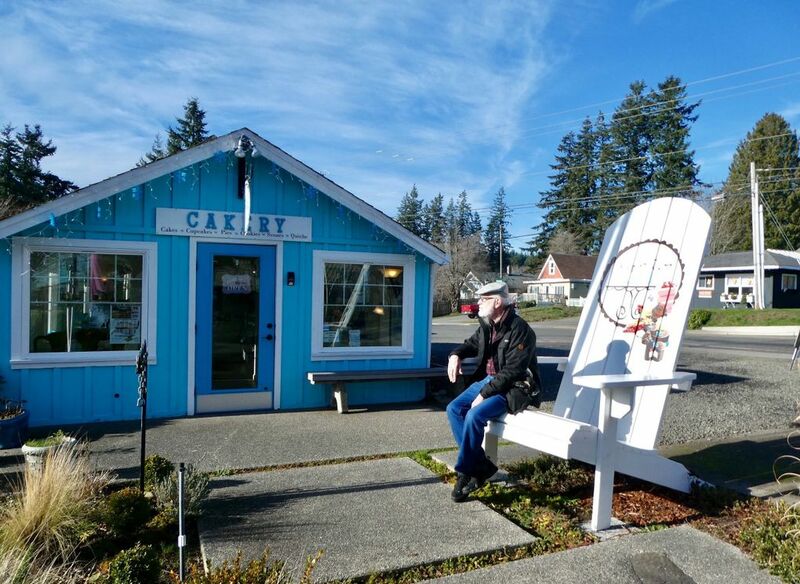 The “borrowed” comes from a time when they borrowed commercial kitchens to sell their first baked goods at the Poulsbo Farmers Market in 2010. The “farmhouse” refers to the 1890s farmhouse where they live in Kingston. We found seats at a big communal table, and split an order (pacing ourselves for a day of grazing) of sweet potato hash, roasted sweet potatoes, bell peppers, spinach and onions, topped with feta and eggs over easy. Some businesses close or keep shorter hours in winter. The eclectic Paisley Whale vintage shop (facebook.com/ThePaisleyWhale) wasn’t open the day we visited, but we found surprise treasures at Kingston Mercantile & Marine (kingstonmercantileandmarine.com) next door to the Borrowed Kitchen. Crammed into this small-town “everything” store are crab pots, rubber boots, jars of local honey and colorful Yak Wool blankets brought home by a local teacher to support a Tibetan refugee family in India. Used paperbacks are stacked floor-to-ceiling across the street at the Kingston Bookery (kingstonbookery.com). 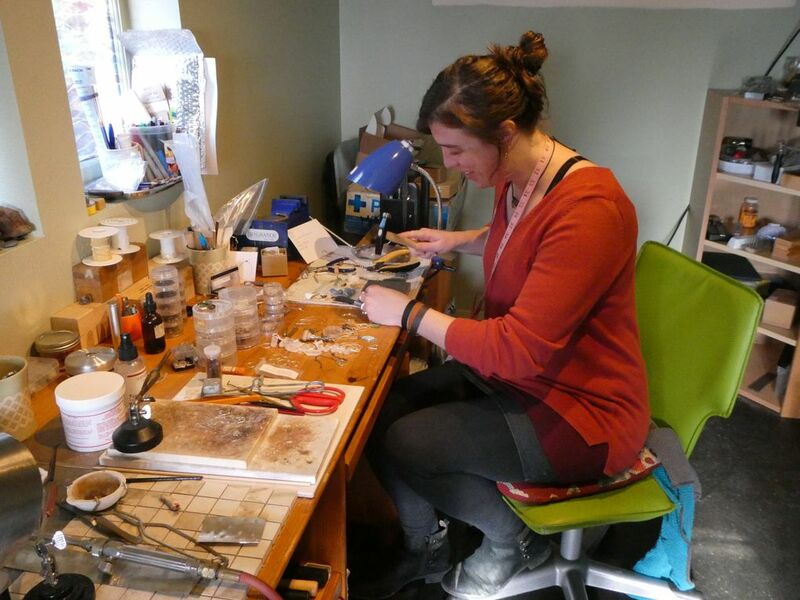 Metalsmith Makenzi Wrinkle makes handcrafted jewelry and sells the work of other local artists at Mak. W Designs out of a shop inside a house at 11133 N.E. Maine Ave. Inspired by “Chocolat,” a romantic comedy-drama about a woman who opens an unusual chocolate shop in a small French town, Methia Gordon runs Sweet Life Cakery (sweetlifecakery.com) out of a 1930s cottage painted aqua blue inside and out. Drop in for “Cake Slice Happy Hour” Tuesday-Friday, 3 p.m.-5 p.m., or try her signature Sweet Bliss, a gourmet Ding Dong-style confection of chocolate cake and whipped cream. J’aime les Crepes (jaimelescrepes.com) provides sidewalk tables for customers ordering sweet or savory French-style crepes from its walk-up storefront near the ferry. Lisa and Rob Maxwell stock old-fashioned lemon and horehound drops, licorice, penny candy, and their own homemade fudge at Little City Candy Co. (littlecitycandy.com). Pick up a map at shops around town or at the visitors information center, and you’ll find locations for several wooded parks and hiking trails. 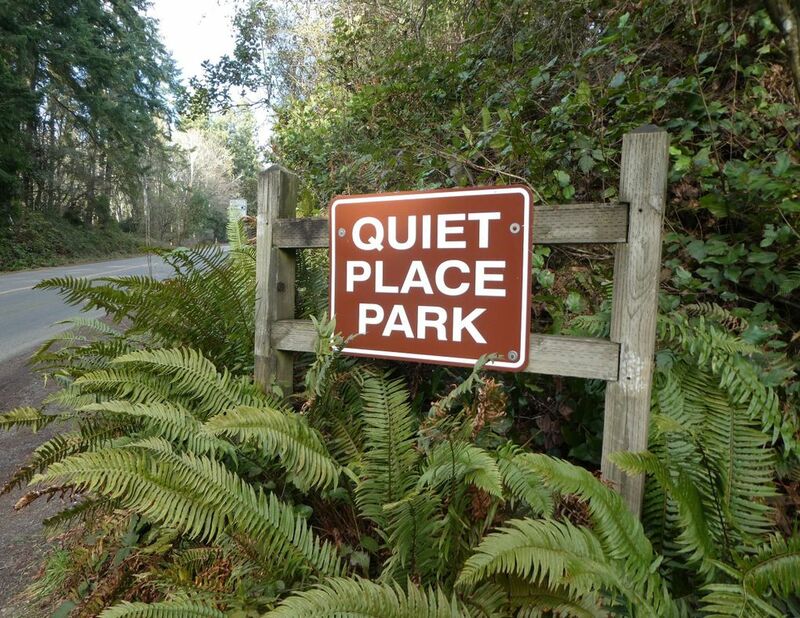 Take a beach walk along Saltair Park when the tide is out, or hike up the hill on Ohio Avenue to a Quiet Place Park, nine acres of walking trails through second-growth forests, named and donated to Kitsap County by Naomi M. Libby Elvins in 1993. 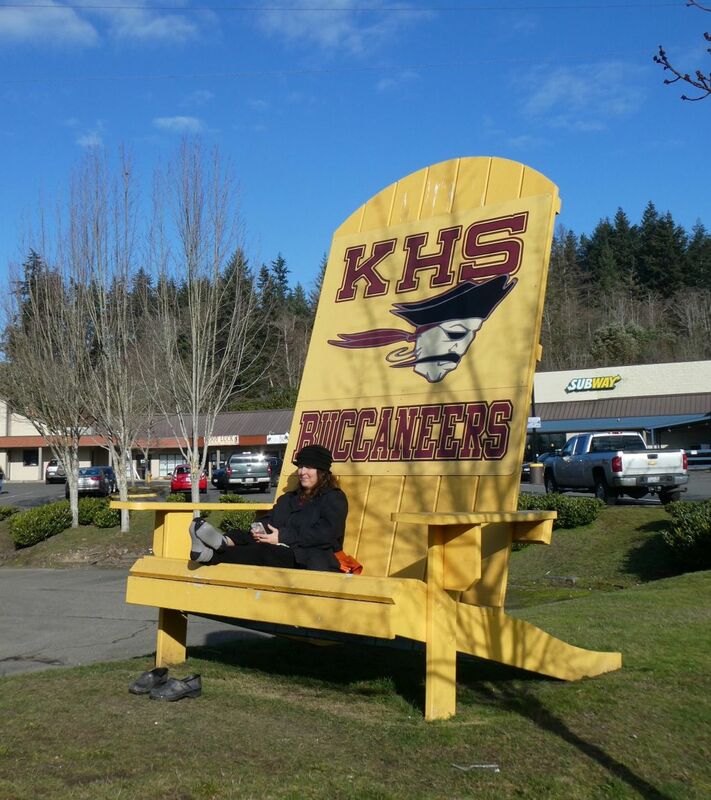 Keep an eye out around town for Kingston’s “Big Chairs,” giant Adirondack-style seats painted in bright colors. A local businessman came up with the concept to promote Kingston as a place to relax. With the last ferry leaving at 5:55 p.m., there’s plenty of time to end the day with a beer, glass of wine or early dinner before returning to Seattle. Filling up fast on warm days are the outdoor tables with water views on the back deck of the Kingston Ale House (thekingstonalehouse.com). Next door, d’Vine Wines offers wine by the glass and small bites (dvinewineshop.com). It’s worth the quarter-mile walk from the ferry terminal to visit kid-friendly Downpour (downpourbrewing.com), where owner Dan Williams keeps 17 taps flowing with local brews, ciders, root beer and Kombucha. We sipped $4 schooners of Stout and snacked on salmon smoked by Poulsbo’s Crimson Cove while Dan tipped us off on what was perhaps the best discovery of the day — an early dinner at Mossback (mossbackcafe.com/new-index), a small farm-to-table restaurant popular with locals. Set back on a side street (you’ll pass it on your way to A Quiet Place Park), the restaurant occupies an old farmhouse that could be mistaken for a private home. Tucked in back is a cozy bar with a few tables reserved for happy hour from 4-6 p.m. 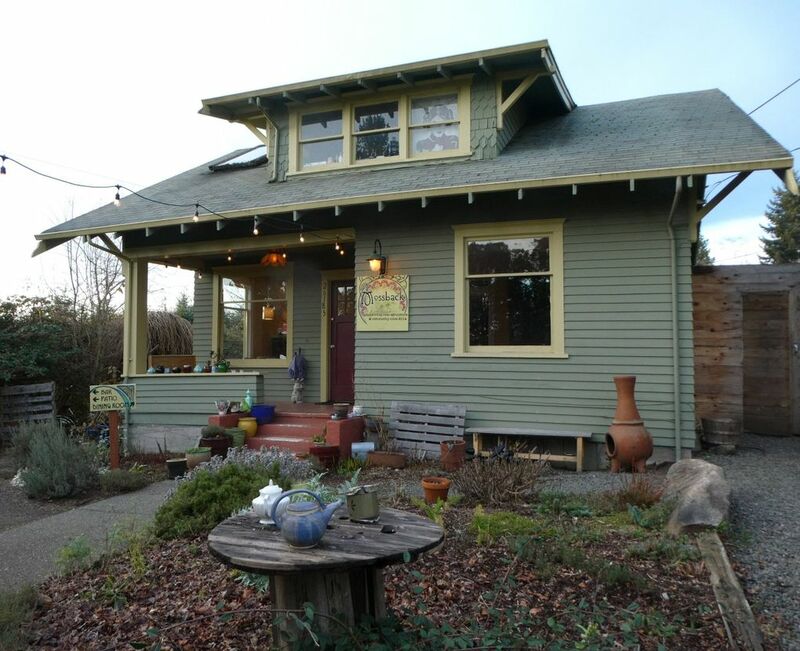 The owners source everything, from wine to oysters, from Northwest producers. Our bill came in under $30 for a glass of wine, a homemade cranberry soda, a bowl of borscht and a deli spread of cheeses, sausage, pickled fruits and veggies, homemade garlic crackers, and onion jam. It was the perfect ending to a day of new discoveries, capped off with a leisurely walk back to the ferry dock to join six other passengers for the return trip to Seattle. Kingston Fast Ferry information: See kitsaptransit.com/service/fast-ferry/kingston-fast-ferry for schedules, fares, bus connections and other information. Ferries currently leave Seattle’s Pier 52 for Kingston Monday-Friday at 6:15 a.m., 7: 55 a.m. and 9:35 a.m., returning at 2:35 p.m., 4:15 p.m. and 5:55 p.m. Plans call for adding Saturday service in May. The trip takes about 40 minutes. Tourism info: See visitkitsap.com/kingston or pick up maps and other information at the Greater Kingston Chamber of Commerce and Visitors Center, 25923 Washington Blvd. N.E. (kingstonchamber.com). Coming up: The Kingston Farmers Market runs Saturdays, 9:30 a.m.-2:30 p.m., May-October at Mike Wallace Park next the ferry terminals.